TOI reports that repeated complaints were being filed as the patients complained of unavailability of all medicines at the distribution corner. Thus, a team of NHRC headed by MP Avinash Rai visited the health university to check on the implementation of Mukhyamantri Muft Ilaaj Yojana. The MP was informed by many that the doctors were prescribing those medicines which were available in the open market and not under free medicines distribution scheme. The doctors indulged themselves in business with pharmaceutical companies, it was alleged. In particular cases, it was alleged that Dr Mann, a senior doctor in the nephrology department was performing dialysis of patients at his private clinic Despite claiming non-practice allowance from the government, Dr Mann was alleged to be indulging in malpractice and private practice. He was suspended in the month of May. 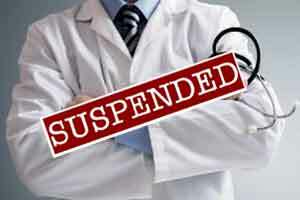 A vigilance committee was formed to look into the matter and the doctor was now suspended. The registrar of PBDUSHS received a written letter from the additional chief secretary for medical education and research for taking appropriate action against Dr Mann. Action has been taken again Dr Karwasara, head of the department of surgery for allegedly asking for money from patients for performing surgery. Many came forward to lodge similar complaints against the surgeon in the past. However, the alleged bribe charges were withdrawn before the investigation started reports TOI. Similarly, head of the department of orthology, Dr Siwach was alleged of indulging in private practice during his tenure as director of Bhagat Phool Singh Medical College. Based on the investigation report by NHRC the three of them were suspended by PBDUSHS authorities and the report has been sent to the state government. HERE IN KAR NATAKA EVEN THE RESIDENT DOCTORS RUNNING THEIR PRIVATE PRATICE JUST COUPLE OF METERS AWAY FROM THE MEDICAL COLLEGE TEACHING HOSPITAL, THE FUNNIEST THING THE MEN IN KHADI (KHADI CLADS ) THEY EVEN CHAIR THEIR INAGURAL FUNCTIONS. ABSOLUTELY NO FEAR, SHAME OR GUILT. WE SEE MANY MORE INDIAS WITH IN BHARTH. MCI HAS CONDUCTED MORE THAN 29 INSPECTIONS IN THE PAST 12 YEARS , I DON\’T THINK THEY HAVE HARDLY CHECKED RESIDENTIAL ADDRESS OF THE INMATES PHYSICALLY EVEN ONCE. THEY NEVER EVER STEPED OUT OF COMPUS EVEN ONCE TO MAKE SURE ABOUT THEIR TRUE PRESENCE. WHICH HARDLY TAKES COUPLE OF MINUTES\’. MCI SHOULD NOT DISCREMINATE BETWEEN THE GOVERNMENT AND PRIVATE MEDICAL COLLEGES.